When you have a pet there are many factors you have to consider when it comes to their health. One of the most important items you choose for your cat is the food you purchase. There are many different brands and formulas of cat food. These foods also come in a wide range of prices depending on the ingredients used and where those ingredients are sourced from. Choosing the best food for your cat can be a determining factor in how healthy your cat is throughout their life. When you’re trying to choose the best premium dry food for your cat, it can be important to consider their age. There are some foods that are designed specifically for kittens, adult cats, or seniors. These foods are created with the specific needs of your cat in mind based on their age. You can also choose a food for health concerns or to help an overweight cat lose weight. Most importantly be sure to read the feeding recommendations on the food you choose so you know you’re feeding your cat the appropriate amount based on their size and age. The following is a list of the top 10 best premium dry foods to buy for cats. The Rachael Ray Nutrish Indoor Complete cat food has real chicken as the first ingredient. This food also contains salmon which is a popular flavor for many cats. The food is specifically designed to meet the needs of cats who spend all their time indoors. The recipe includes lentils, which are rich in fiber, to help promote a healthy weight and metabolism. 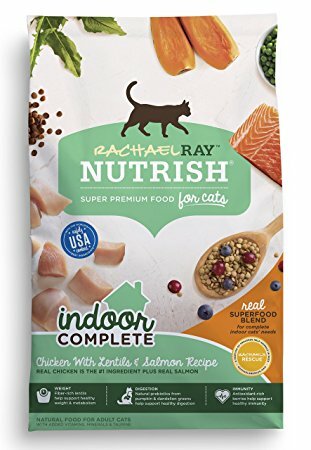 This cat food from Rachael Ray Nutrish has antioxidant rich berries to help with a healthy immune system. The formula also contains naturally occurring prebiotics from pumpkin and dandelion. This unique blend of ingredients helps with digestion and can prevent stomach upset. 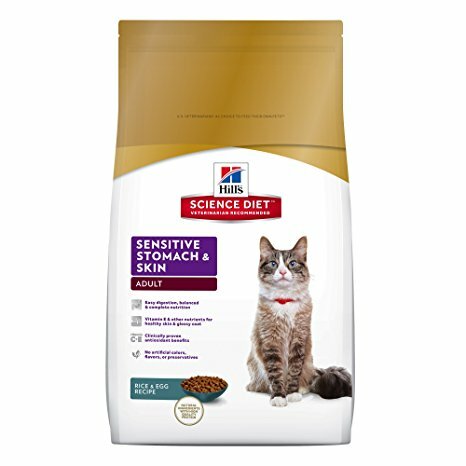 The Hill’s Science Diet Sensitive Stomach and Skin dry cat food has a special formulation for cat’s with special dietary needs. This food contains an antioxidant blend that helps promote immunity and overall health. This dry cat food is designed for use with adult cats who have sensitive stomachs or experience skin problems associated with other cat foods. 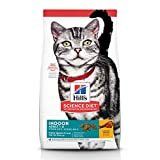 This cat food from Hill’s Science Diet has ingredients that have been proven to be easy to digest for cat’s with sensitivities. The food includes vitamins and omega-3 fatty acids to help improve the condition of your cat’s skin and coat. 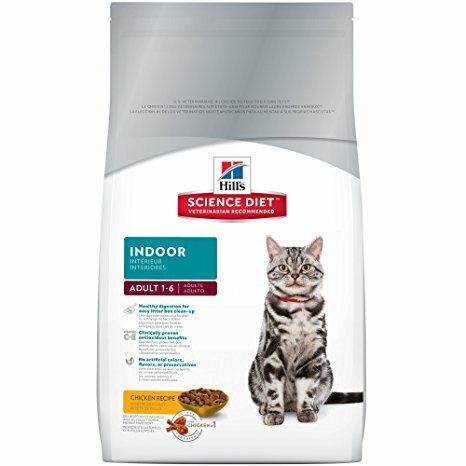 The Hill’s Science Diet Indoor dry cat food was created for adult cats who are 7 years of age or younger. This food is designed with the specific needs of indoor cats in mind. It is free of artificial colors, artificial flavors, and preservatives. The food contains antioxidants that have been shown to improve the overall health of indoor cats. 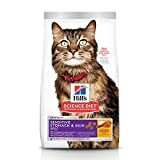 This cat food from Hill’s Science Diet has a formula that promotes healthy digestion and easy litter box cleanup. The food is made from natural ingredients with chicken as the first ingredient. Also included are vitamins, minerals, and amino acids that are essential for your cat’s health. 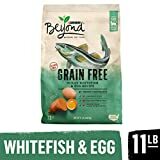 The Purina Beyond Natural Grain Free dry cat food in Ocean Whitefish & Egg has a specially formulated recipe that provides your cat with the nutrients needed for a long and healthy life. This food uses real ocean whitefish as the first ingredient. The food is free of corn, wheat, and soy which can cause digestion issues and skin problems in many cats. 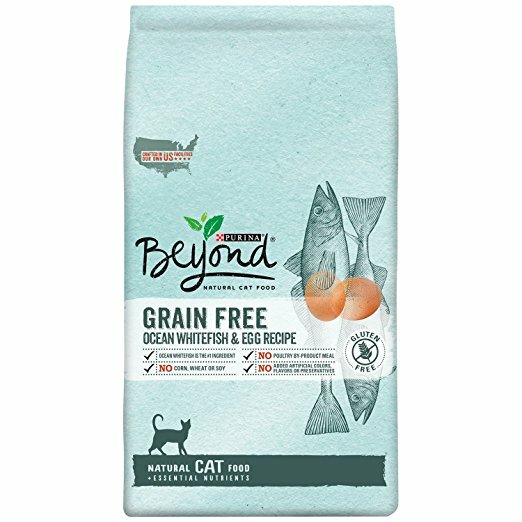 This food from Purina Beyond doesn’t contain poultry by-products. The grain-free formula is ideal for all cats, but can be especially beneficial for those with sensitivities. The formula doesn’t have any artificial colors, flavors, or preservatives. 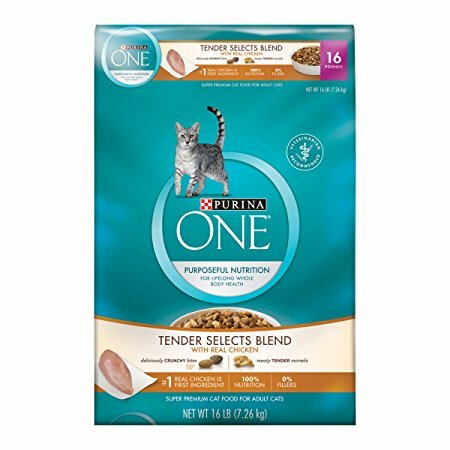 The Purina ONE Tender Selects Blend is made with real chicken. This dry cat food is made from 100% beneficial ingredients with no fillers. It has omega-6 fatty acids which help promote a healthy skin and coat. The food also contains ingredients that help promote an active immune system to keep your cat healthy. 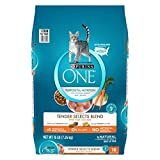 This dry cat food from Purina ONE has chicken as the first ingredient and also includes turkey for a recipe that most cats will love. This food has a high level of protein to help cats stay active through their adult life. The food also helps promote a healthy metabolism and weight. The BLUE for Cats Adult dry cat food is available in 3 pound, 7 pound, or 11 pound size bags. The food is made with real ingredients and contains no poultry by-products. The food also contains wholesome grains and veggies for added vitamins and minerals. This food from Blue Buffalo has deboned chicken as the main ingredient. It also has antioxidants to promote a higher level of overall health. This dry cat food is ideal for adult cats and has a formula that is tasty to most. The food is free of corn, soy and wheat to prevent issues for cats who have sensitivities to those ingredients. 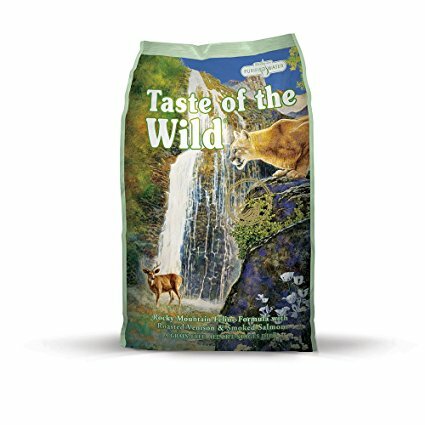 The Taste of the Wild Grain Free dry cat food has a high level of protein that is especially beneficial for active cats. This food also helps to promote a healthy digestion and healthy weight. The food is available in 5 pound or 15 pound bags. The venison and salmon flavor is tasty to most cats and contains an optimum level of amino acids for overall health and wellness. 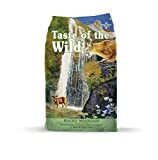 This cat food from Taste of the Wild is grain free to prevent health issues many cats have when they eat grains. The food is also free of fillers, preservatives, and artificial ingredients. This food is made by a family-owned operation that is USA-based. The BLUE Wilderness High Protein dry cat food is grain free and also contains no gluten or poultry by-products. 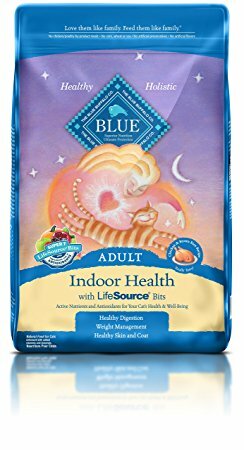 This food was designed to provide cats with all the vitamins, minerals, and antioxidants needed for a healthy life utilizing the brand’s LifeSource Bits. 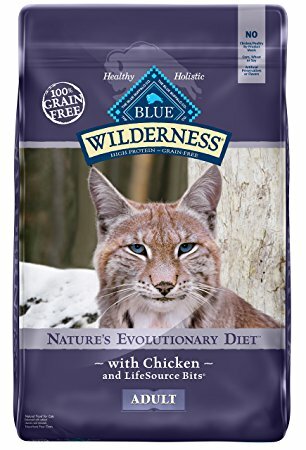 This premium dry cat food from BLUE Wilderness contains blueberries, cranberries, and carrots as natural sources of beneficial antioxidants. The main source of protein is deboned chicken. This food is free of preservatives and contains the essential amino acids needed for your cat’s health. 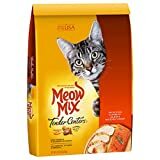 This food from Meow Mix is an affordable option for those looking for a nutritious food that most cats will love to eat. This food comes in several different sizes and flavor options so that you can find the best one for your cat. The dry cat food has a blend of vitamins and minerals that helps promote healthy weight and metabolism. The Meow Mix Tender Centers dry cat food has a crunchy outside with a meaty inside to make meal time interesting for your cat. It has a balanced formula that provides the nutrients your cat needs to live a long and healthy life. The Purina Cat Chow Naturals dry cat food contains a natural fiber blend that helps control hairballs and promote healthy digestion. 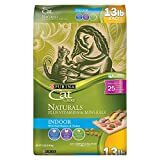 This food has a 100% balanced formula that works to keep your cat happy and healthy throughout their different life stages. The food is made with real chicken and turkey for a recipe that most cats love to eat. This affordable food from Purina contains no added preservatives or artificial ingredients. It contains 25 vitamins and minerals for all the nutrients your cat needs for a healthy weight and active metabolism. The food comes in several different bag sizes. Choosing the food your feed your cat is one of the most important decisions you make as a pet owner. When you give your cat the best food available, you are able to offer them all the nutrients they need to live a long and happy life. There are many different brands and formulations of cat foods on the market and it may take a few tries to find the best option that improves your cat’s health. Some cats may be picky about their food so you may also need to switch up the flavors until you find one that suits your cat’s tastes. When shopping for cat food you should be aware that many of the premium dry cat food brands are free of grain, soy, corn, and preservatives. Some are also free of all artificial colors or flavors. Some cats can have adverse reactions to these ingredients like dry skin, dull coat, or other health issues. If you read the ingredient list on the cat food brands you’re considering, you may realize that many of the premium brands offer meat as the first ingredient. This works well for cats as they are natural meat eaters who would rarely, if ever, eat other types of foods in the wild. You can read consumer reviews on the brands you’re considering for objective and useful information on the dry cat foods that are available.